Ultra slim 260mm (W) x 200mm (D) x 35mm (H) chassis width segregated flow thermal solution. The SI-28 Signage Solution System - an ultra slim embedded system tailored for Digital Signage Applications. The SI-28 combines the graphics performance of a discrete ATi E4690 GPU with 512MB of dedicated GDDR3 video memory and the efficient computing resources of an AMD Athlon based embedded CPU. It is able to support 1080P independent displays with VGA, DVI, or HDMI interfaces up to four. The design allow you to wall mounted or used on a desktop. It Features: Quad HDMI outputs, Quad USB 2.0 ports, built-in Gigabit Ethernet and audio outputs. 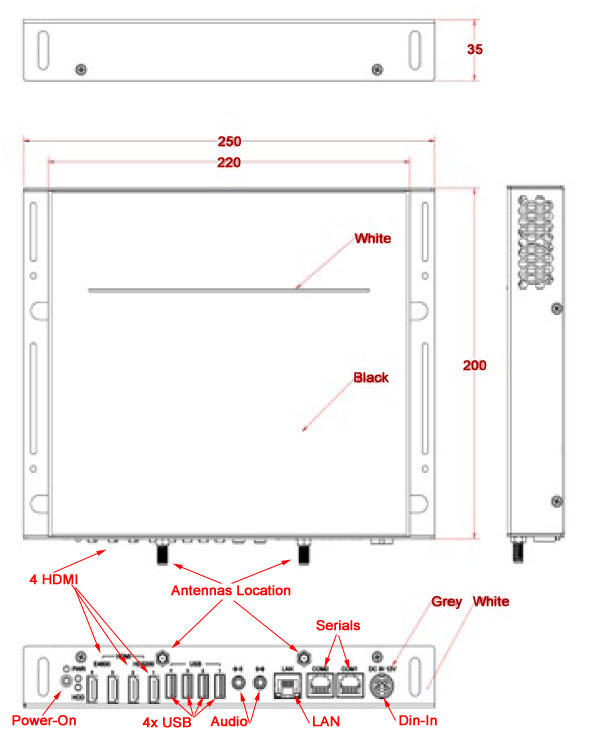 An integrated 802.11n WiFi or NTSC/ATSC TV Tuner is optional. Up to 4GB of DDR2 main memory and a choice of hard drive or solid state storage is available. A segregated flow thermal solution prevents the accumulation of contaminants on the system¡'s electronics, and dual redundant Maglev fans provides for worry free 24/7 operation over extended durations. Ideal for Digital Signage installations where space is at a premium and reliability is not optional.